The golden suits of team Japan in 2010 unfortunately didn’t yield the correspondingly-coloured medals. I had intended to use this ‘day off’ from speed skating events to write about what makes up an elite athlete, or perhaps what factors go into making successful training programs in terms of the individual athletes, as well as national-level programs, the Dutch of course being quite the success story of these games so far. Without presenting any real evidence apart from “nobody from the USA has finished above 7th” they go on for several hundred words about how awful the suit is, and there are several carefully-measured quotes from various sources close to the US team. This was no doubt inspired by world record holder and defending Olympic champion in the distance Shani Davis’ unexpectedly poor performance, followed on the next day in the ladies 1000m where both American medal hopefuls failed to make the podium despite both them breaking the previous world record only a few months ago. In fact, in the article, most of the people interviewed either carefully avoided saying anything about the suits, or simply outright said that it had nothing to do with the suits. Readers with memory recall ability superior to goldfish will remember my first feature article of these games, which addressed the question of whether the suits made a difference. The answer was that the difference was very small, but of course in a sport such as speed skating where medals can be decided by hundredths of a second, that small difference can make a significant impact on the results. The science would generally agree with this. 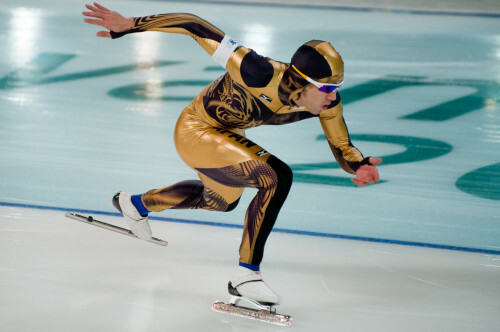 Most speed skating suits these days are wind tunnel tested and there isn’t a whole lot of difference between any of the designs in use today. The difference is small enough that a few degrees less of knee-bend would put you at a significantly greater aerodynamic disadvantage than wearing the wrong suit. Peter Mueller, who was quoted in the article, made an important point when he said that there are two ways that a suit can affect performance – aerodynamics, and psychology. Ice skaters are very temperamental creatures and if anything ‘feels’ slightly off, it can have a significant effect on performance. So, are the new suits slower? Luckily, it is easy to answer this. Last year, in March, at the end of the season, the world single distance championships were held in Sochi. This is normal practice so that the next year’s Olympic venue can get a ‘practice run’ at all the technicalities of organising and executing the big event. It is the end of the season, and everybody peaks for it, and everyone who can go goes, since being at the Olympic venue, it is the perfect opportunity to get a feel for what the ice conditions are like (and these can vary enormously between different venues). The answer is, unsurprisingly, no. No, the suits are not slower. In fact, going through everyone’s times one notices that every single skater from the US who skated at both world championships last year, as well as the olympics this year actually improved on their previous times. To say that the suits are slower is to ignore the facts – the cold, hard facts. Let’s look at it this way, suspend your disbelief for just a moment and say that the suits were a contributing factor. The difference would be worth a tenth of a second per lap at most. If we took all the American’s times and improved them by 0.25 seconds in the 1000m, and 0.125 seconds in the 500m (and 1.25 seconds in the 5000m, and 0.75 seconds in the 3000m), then the Americans would have still finished outside of the medals. The best result would have been Heather Richardson in 4th in the 1000m. So why is this news? Because the Olympics happens once every four years, and speed skating is thus under a scrutiny that it isn’t used to. People don’t understand that suits don’t make that big of a difference, and Americans in particular are bad at admitting when they’re just not very good. But that’s not a fair thing to say, the American skaters are very good, but this time there were just a few skaters who were better. Why is it so difficult to accept that? At the low altitude and seaside location that Sochi is, the ice conditions are relatively slow. I and others have noticed that skaters who are used to skating and training at altitude are struggling with the ice conditions. Sure, the only non-Dutch medal in the men’s competition so far has gone to a Canadian, but every other medal has gone to a skater who trains at low altitude ice. The Americans didn’t help their cause by locating their pre-Sochi training camp in Collalbo, Italy, which despite being slower ice than Salt Lake City, is also at altitude. Many Dutch skaters also held their pre-Sochi preparations at Collalbo, but they were already used to, and conditioned for slower ice. The manner in which the suits were introduced also presents a problem. They were given to the US athletes just prior to the start of the games. That’s never a good idea. I understand that Under Armour probably wanted to make a big impact with the big reveal of their Olympic suit, but like I said before, long track skaters are notoriously temperamental things, and messing with something so (literally) close to them, just before the games is inviting trouble. The smart thing to do would have been to ‘secretly’ introduce them during the first races of the season, but still with the old paint jobs on them (so that they look like the old suits), then when the Olympics comes around, to reveal the ‘new look’ on what is technically the same suit. This gives the team time to iron out any problems, even if they are only psychological. There is no evidence to suggest that the suits are slower. They’ve been wind-tunnel tested, and now also tested in competition. Any reasonable analysis of the times shows that they either make no difference, or actually make the skaters faster. Any perceived difficulties are most likely psychological – a factor which should not be ignored. As was mentioned in my previous article concerning suits, they only account for a very small difference in the times anyway, and even if we assume that the suit is actually slower, the potential improvement would still not have placed any Americans within the medals. There are a myriad of reasons why they might not be performing to expectations, many of them are far more significant than just the suit, and one of them may simply be that those expectations were too high. I have included links below to the results of speed skating at the Olympics so far as well as to the results from last year’s world championships so that people can look at the times. NOTE: A previous version of this article carried the strong implication that the authors of the original article were trying to generate a story out of nothing. This was incorrect, and I apologise wholeheartedly to those authors if they ever happen to read this article. Don’t forget to click below on the sochi2014 tag to read other articles about these Olympics, including daily updates of the long track races, and the other feature article about the difference between short track speed skating and long track. For the real nerds out there, there are older articles about the differences between ice and inline skating, on skating at altitude, the olympic selection process, my technique lab, and the major differences between the different types of competitively-used long track blades. Thank you for responding to the initial article that was completely ridiculous. what’s Next? An article that Shawn White’s Board Wax was too fast or two slow?